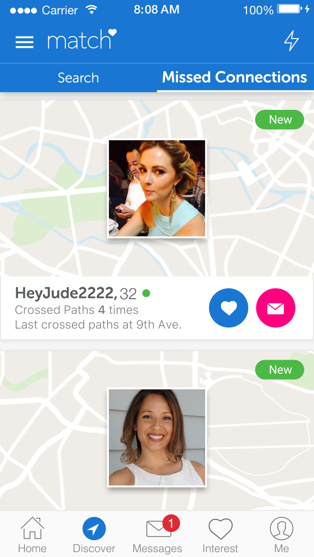 Match is rolling out a new feature that will help its dating app customers see who they’ve crossed paths with in the real world, and say “hi” if they’re interested in chatting. 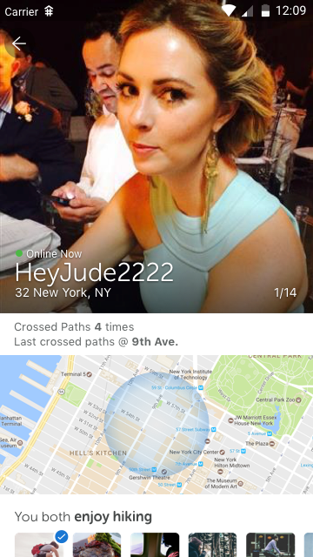 The opt-in feature called “Missed Connections” takes advantage of location-based services on the users’ phones, but is designed in a way to ensure user privacy, Match says. That is, Missed Connections doesn’t offer your real-data location data to others. Instead, members who passed each other by are only shown this information after the fact. In addition, members can block other users, if they are uncomfortable. Those users will then be removed from the system until their case is reviewed. Missed Connections also doesn’t show your precise past location to others. In other words, it won’t show that you passed someone by at the “Starbucks on Madison,” but rather shows an intersection point within one block (e.g. “Prince and Broadway”) as well as how many times you’ve crossed paths with that person. A spokesperson tells us that you’ll be able to see who you crossed paths within “just a few hours,” however, which gives the feature some feeling of immediacy. You can then click on a user and connect with them through Match’s existing messaging feature. Because messaging is only open to paid members, Missed Connections is also a feature only for Match’s paid subscribers. The idea of connecting with someone you spotted in real life, but didn’t speak to, has been a longtime staple of newspapers’ classified ads. But in more recent years, startups have offered a modern-day twist on this. For example, missed connections is the entire premise of the dating app Happn, which said a year ago it had grown to reach 10 million users. It now has 26 million. And the company is currently projecting 40 million by year-end. That optimistic projection may not come to pass, now that Match has taken on Happn directly, but Happn CEO is not fazed by Match’s news. According to Match, Missed Connections will be available to members starting today via a pop-up introduction page in the app. Once in the Missed Connections section, you’ll be able to view a feed that shows you who you’ve recently crossed paths with in the real world. But unlike on Happn, this feed is curated based on your current matching criteria in addition to your location. Happn, meanwhile, only lets you narrow down by “men,” “women” and age. Missed Connections is available in the updated Match app for iOS and Android, starting today. Updated 1/26/17, 11 AM ET with Happn’s current user numbers and further statements.